From The Architect, July 24, 1875: Owing to the site for the church being about six feet below the road, and to the soil being entirely of peat for some depth, very costly foundations have had to be constructed. A crypt nas been formed under the whole of the building, which will be available for Sunday Schools, parochial meetings, &c. The ceiling of the crypt has been constructed of cement concrete to form a floor for the church. After some delay owing to the quantity of water which rose in the excavations, the foundations for the chancel and two bays of the nave have been completed to the floor line of the church. The church will consist of a chancel 40 feet deep and 27 feet 0 inches wide, and nave 77 feet long of the same width, with north and south aisles 13 feet wide. Tbe chancel, which will have a square east end, will have aisles running round on the north, south, and east sides 6 feet wide. The nave arcade will be of five bays, and at the west end will be a narthex 14 feet wide. There will be a gallery for the organ under the tower on the north side of the chancel. The sacristy will be reached from the north chancel aisle. The walls will be faced with red bricks, and Bath stone will be used for the arches, shafts, &c. The piers of the nave arcade will be of red Dumfries stone. The roof over the nave and aisles will be of fir. The chancel will be vaulted with red brick and stone ribs, the height of the apex of which will be 46 feet, the roof over will be 63 feet to the ridge. The chief entrance will be from the Lynton Road, through a large porch at the north-west end. The baptistery will be at the southwest end of the nave. The church will seat about 900 adults, and will cost about 12,000/., exclusive of the steeple; the whole of the seats will be free and open. 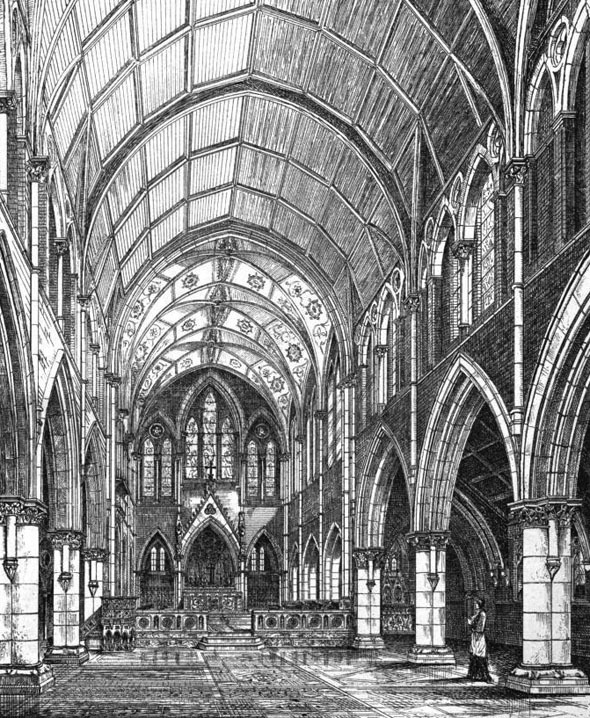 The chancel and two bays of the nave are now being built by Mr. Shepherd, of Bermondsey New Road, at a cost of about 6,100/. Messrs. Henry Jarvis & Son, of Trinity Square, Southwark, are the architects.